I didn’t take the traditional path to become a strength and conditioning coach. Many of the strength coaches out there played and loved high school sport and then went on to study the academic aspects of training. This is a legitimate path. Others simply take a weekend course and hang out their shingle – it might surprise you to know that even some of those guys are pretty good too. Growing up I had a dream that was the same as most of the other kids in my small hometown. I wanted to play professional hockey. When I wasn’t drafted into the OHL, I knew the cards were stacked against me. I knew that I could not control what the coaches thought of me or how my opposition played, so I dedicated myself to working hard on the things I could control – my fitness and skill development. After a lot of hard work I earned a spot in the OHL as a walk on. From there, I took that next step to my first professional contract and continued to play in the ECHL, AHL and European leagues for four seasons. 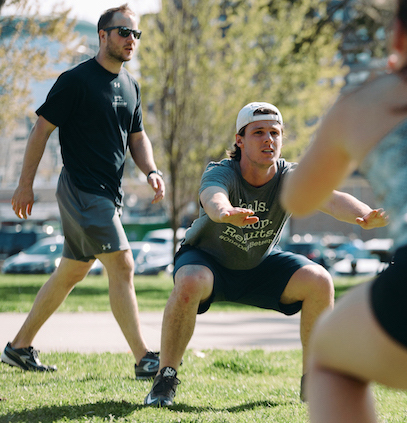 The further I got with my professional hockey career, the more my interest in strength and conditioning grew, because I literally saw the difference it could have on a player’s performance on the ice. I saw hockey players who had the skill to play in the NHL, but they either were not working off the ice, or even worse, they were working hard, but on the wrong things. This revelation led me to the decision to pursue strength and conditioning as a profession. I am proof that with great training, a systematic approach, perfect technique and dedication, even an underdog can achieve success and live their dream. Proven training systems to suit your current level and future goals.